I recommend that even serious competitive Ironman triathletes perform only three independent runs per week. The most important of these is the weekend long run. Complete at least four runs of 18 miles or more, and feel free to go as long as 26.2 miles in training to cement a solid reserve of running endurance. Put as much as you want into your long runs, within reason, but resist the temptation to do any more running during the rest of the week than is required to support your progress in these long runs, as it will only increase your risk of injury and burnout and take away from your cycling. After building your base, add one easy mile of running after one ride in the week. Then add an easy mile of running after a second ride the next week and continue in this manner until you are running an easy mile after each ride. Next, add a second mile of easy running after one ride, and the following week add one easy mile to another post-ride transition run. Finally, over the ensuing weeks, gradually increase the pace of those two two-mile transition runs until you’re doing them at roughly your lactate threshold pace. Pure runners typically perform two fast runs each week. Pure cyclists typically perform two fast rides each week. Many triathletes try to do two fast rides and two fast runs each week. I don’t think this is a good idea for anyone, except perhaps World Cup racers, but it’s definitely not a good idea for those training for Ironman events. The problem is that fatigue from cycling transfers all too well to running, and vice versa, such that doing two hard rides and two hard runs weekly is almost tantamount to a pure runner doing four hard runs every week. Fatigue will accumulate, and performance in all of those hard workouts will be compromised. Even for those few athletes who hold it together, the Ironman marathon is run at a relatively low intensity—about 60 percent of VO2max. While faster runs could theoretically stimulate improvements in aerobic capacity and efficiency that would enhance performance in the low-intensity Ironman marathon, these theoretical benefits are outweighed by the fatigue cost that would come with trying to combine high-intensity run training with high-intensity bike work. 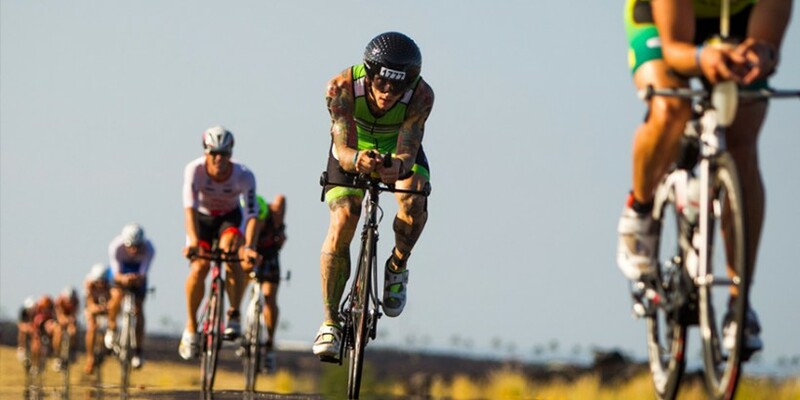 I believe that Ironman triathletes are better off committing themselves to either one or the other, and specifically to high-intensity bike training. Doing two hard rides per week in addition to a long ride will make you that much stronger on the bike and that much more likely to have enough legs left at the start of the marathon to hold goal pace—which, again, is not a particularly fast pace for any triathlete—all the way to the finish. And keep in mind that, just as fatigue crosses over between cycling and running, so does fitness, albeit to a lesser degree. So you can count on those hard rides to also elevate your running a bit. I am not suggesting that you avoid fast running altogether, but I am suggesting that you strictly limit it. In addition to the threshold-pace transition runs I described above, you may also do some fartlek runs with 30- to 60-second spurts of 5K to 3K race pace running scattered throughout an otherwise steady, moderate-pace run, some very short (eight to 10-second) hill sprints after you’ve completed one of your weekly easy runs, and progressions, consisting of one to three miles of running at marathon to 10K pace at the end of a base run or long run. That should do it. Running a marathon off the bike will neither seem nor be quite as hard once you’ve gotten this metric Ironman workout under your belt. Many Ironman marathons are ruined by nutritional issues, and nine times out of 10 the specific nutritional issue is consuming too much rather than too little. Triathletes very often overestimate both the amount of nutrition they need to get through an Ironman and the amount their bodies can actually absorb and use. If you can take in 60g of carbohydrate and 750ml of fluid per hour on the bike, which is very easy to do with nothing more than a sports drink, you should be fine. Few athletes can absorb and use more than 80g of carbs per hour. If you’re a bigger athlete and your race takes place on a hot day, you may need 1 to 1.2 liters of fluid per hour to prevent a dehydration-related slowdown. But 80g of carbs per hour and 1 to 1.2 liters of fluid per hour are still a lot less than many triathletes try to cram down. The rub is that the body can absorb a lot more fluid and carbohydrate during cycling than during running due to the stomach jostling involved in the latter. So what happens is that competitors take in as much nutrition as their bodies can handle on the bike, then hop off and start running only to be hit with nausea, bloating and worse. So be careful not to overdo your nutrition intake in the last hour of the bike leg so your gastrointestinal system won’t declare mutiny at the start of that all-important marathon.